Nevada is known around the country, rightly or wrongly, as a place where anything goes. When it comes to illegal activity, however, this is definitely not the case. The state’s freewheeling reputation has led to some confusion for tourists and other visitors who come to Las Vegas, particularly when it comes to solicitation of prostitution. The attorneys at Guymon & Hendron are adept at defending residents of Nevada and those from out of state against solicitation charges, as well as a wide range of other criminal charges. Is Soliciting Legal In Nevada? In our state, prostitution is illegal in counties over a certain population level. Clark County, where Las Vegas is located, is among the locales where it is illegal. Therefore, it is possible to be charged with solicitation in Nevada or Clark County. Being convicted of soliciting a prostitute can have a wide-reaching effect on people, whether they are Nevada residents or not. The stigma of this kind of conviction can have a wide-ranging impact on a person’s personal and family life, as well as his professional life. A criminal conviction is a matter of public record, and having an employer learn about a conviction on a solicitation charge could lead to problems at work, if not outright dismissal. 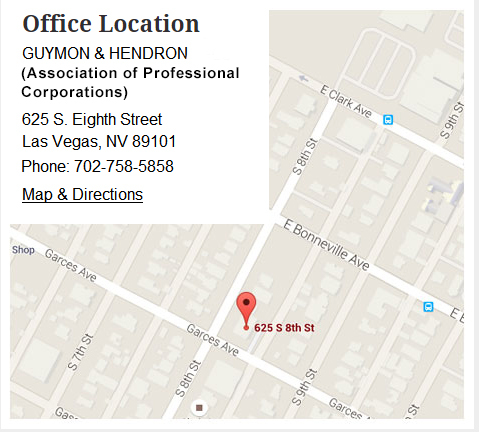 The lawyers at Guymon & Hendron are available to discuss your case in a no-risk complimentary consultation. Call our offices at 702-758-5858 or email us your contact information.